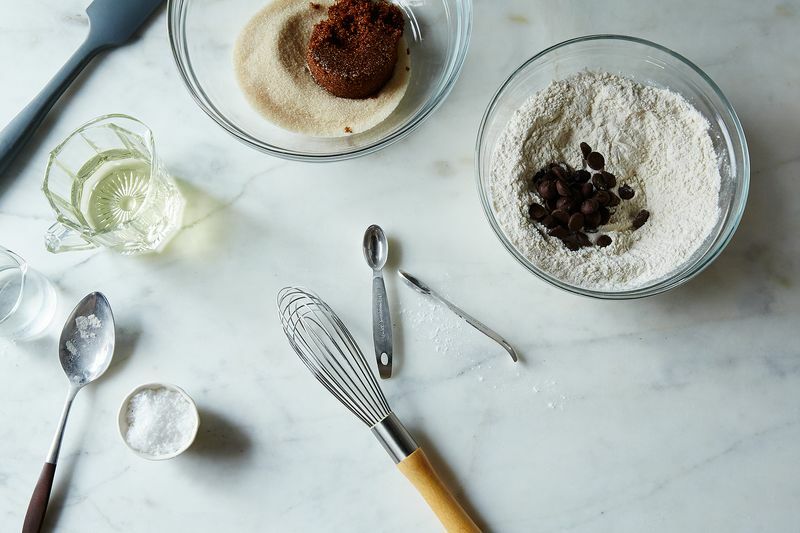 The technique is, if anything, simpler, since there's no waiting for butter to soften or 2-stage creaming involved—just a vigorous whisking of all the wet ingredients before adding the dry. But there is one crucial extra step: "The dough has to be refrigerated for at least 12 hours and up to 24 hours before being scooped. I know, it's tempting to skip this step. DON'T," Kulaga wrote to me. 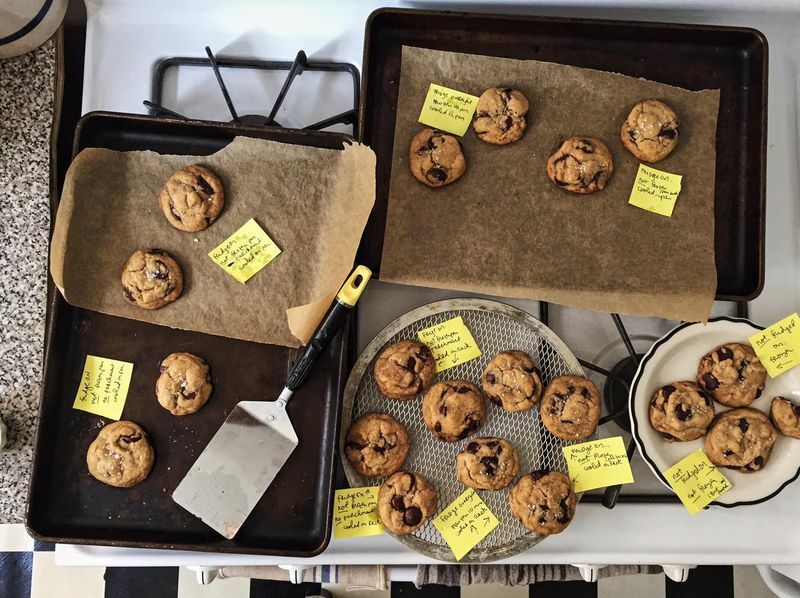 You might have already learned about the dough-refrigerating trick in David Leite's famous New York Times article from 2008, in which he revealed that all of the top bakeries in Manhattan agree that resting—or hydrating—your dough for a day or three makes for better cookies. The flavor is richer and more developed; the texture smoother, more nuanced, and further away on the spectrum from raw flour. But the ultimate recipe he settled on, based on Jacques Torres', had quite a few hurdles—as brilliant as it was. It called for both bread flour and cake flour, and pricey chocolate fèves, and the dough was at its best 72 hours after mixing. 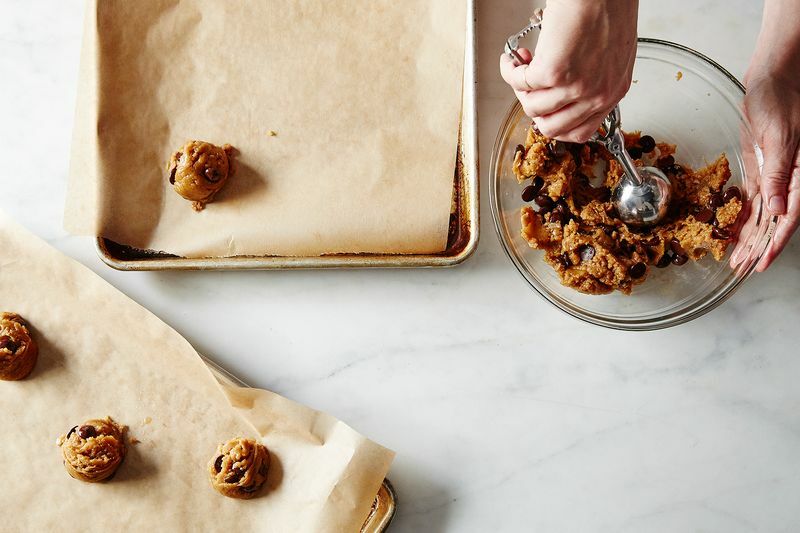 Because Ovenly's cookie dough has no egg to slow down the hydration, it hits its peak much faster. I've even baked off the dough straightaway after mixing it (I'm sorry, Agatha! I'm sorry, Erin!). This was the biggest, and perhaps only noticeable, difference—the flavor a bit more flat, the texture a tad coarser. But I fed a lot of these to a lot of coworkers and there wasn't a problem. I used a scale to measure out all the dry ingredients in this recipe and measuring cups for all the liquid, but when I mixed the flour mixture with the sugar/oil/water, the dough looked much wetter than what's in the video. It was more of a pancake batter consistency. My dough is resting in the fridge right now but I'm worried about what the end result might look like. I'm happy to report that the cookies were amazing! Everyone who tried it loved it. I am not a regular cook but the simple recipe emboldened me to try it. I did and was pleasantly surprised that the chocolate chip cookies turned out just as demonstrated by Agatha and Erin even after a couple of mistakes I made. 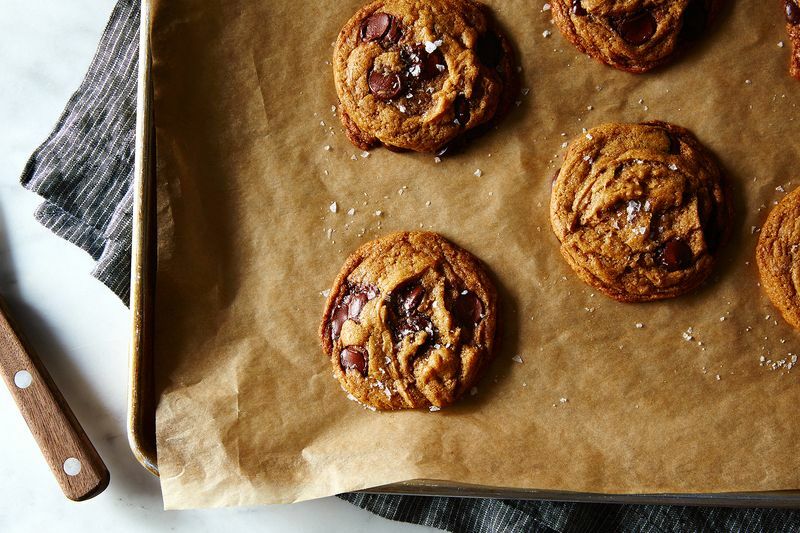 The cookies are crisp on the outside and chewy on the inside. In fact, they taste much better than the ones I bought from a grocery store. What I don't understand is how could experienced cooks in this forum messed it up! Thank you very much Agatha and Erin and Food52 for presenting us with this magical yet simple recipe. Thanks again. Fabulous! I just made a batch of these, following the recipe exactly (which I seldom do), using canola oil. They look great (golden on the edges after 13 minutes in the oven), have a nice texture, and taste like a bona fide chocolate chip cookie. I appreciate this recipe! The one I’m also REALLY interested in is Ovenly’s vegan peanut butter cookie recipe! We like to say away from soy and to have the recipe would enable me to tweak it using good substitutes. Wait, what? Vegan sugar? Since when? Just made these and disappointed, very bland taste even after adding vanilla. They never flatten out as shown in the pic. Annoying to waste ingredients on something that doesn't taste good. Would not make again. I have lately been wondering about baking with the great plant protein powders that we have now, pea protein, hemp, garbanza. Wondering is anyone has tried these instead of grain flours. What if I need the cookie to be gluten free as well? My experience with gluten free flour is not great. Folks.... a recipe is just a guide. We do not use canola in my household and so my mind goes straight to suItable substitute. Fortunately, in my little world, peanut allergies do not exist and so I will try with peanut oil. Use an oil that makes sense for your dietary needs and budget. Delicious and Beautiful job Emma!!! Canola oil is a far inferior, bad choice oil. Let's move on from the myth that it's "healthy." Yes, many are, but always best to check the ingredients to make sure there are no milk products added. I made these and as others have mentioned, they did not flatten. as a chef and long-time pastry and cookie maker, I have to say I would make these as written but with one addition - vanilla!! There is none listed with the ingredients and I don't believe there is any animal product in it, so why was it excluded? Most chefs know that vanilla adds so much to almost any recipe and in fact brings out the flavors of the other ingredients. I would never make these without it! I'm not sure why you would use canola oil. Do you know how that's made?? Olive oil or coconut oil is best! Has anyone successfully used this as a base for oatmeal raisin? Agree with many that there wasn't anything special about these cookies and they did not flatten. I followed the recipe exactly. I am quite partial to vegan food and have nothing against them in that regard. Sadly I have to report I was disappointed. Has anyone tried baking these with coconut oil? I had the same reaction as secondbasil and sarla combined. They were just okay and they never flattened which meant that I had to flatten them (something I absolutely hate. In addition, the timing is great if you have time to bake cookies between am and about 4:00 pm or you start them really, really late at night. I felt that they were just as much trouble as normal cccs just a different type of trouble. . . I made these last weekend and they were ok. I was a little disappointed in the color, they turned out a little pale and I din't want to overbake them. Maybe because I used light brown sugar? Also, there was a slight hint of raw flour flavor which I thought would disappear after baking, but it was still there.